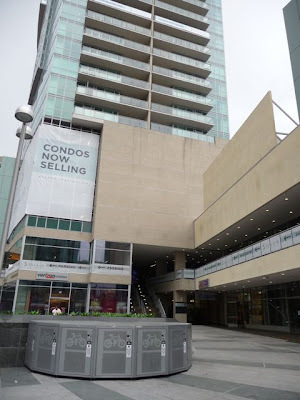 Here's a link to Koreatown Part I from last week. Now on to Part II . . . 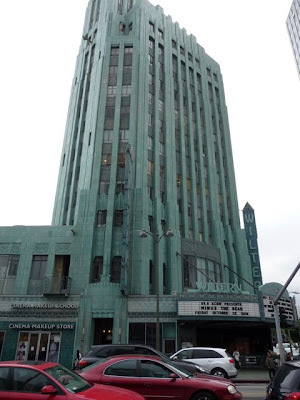 Located on the corner of Wilshire and Western in Koreatown is the Wiltern Theater. The Wiltern comes from the location: corner of Wilshire and Western. Clever, huh? 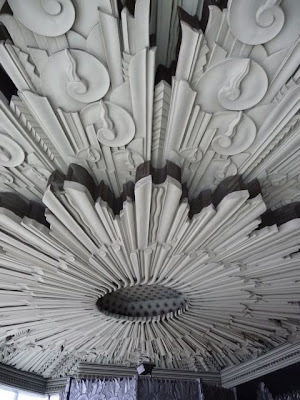 This is at the entrance: the theater opened in 1931 are is consider one of the finest examples of Art Deco architecture in the United States. 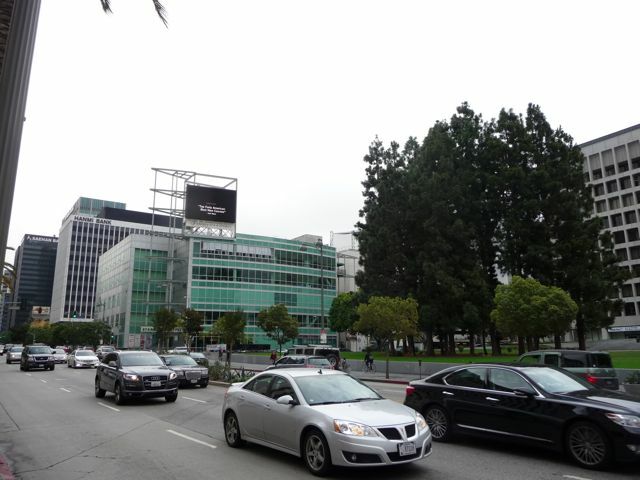 This is Wilshire Blvd. 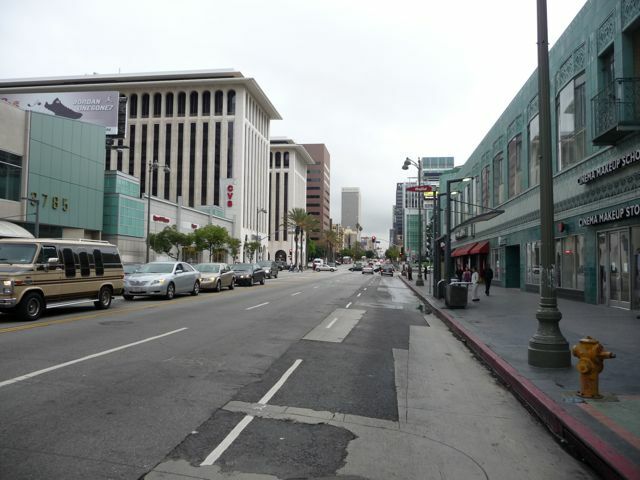 looking east, with the Wiltern Building to the right. Underneath Wilshire Blvd. - the busiest street in Los Angeles - is the Red Line/Purple Line Subway. 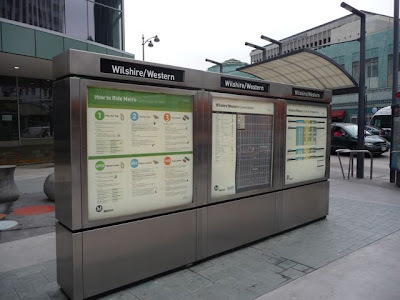 Both lines begin in downtown and travel west along Wilshire. The Red Line heads north at Vermont and goes to Hollywood and North Hollywood. The Purple Line continues along Wilshire another mile and terminates here at Wilshire and Western. The Purple Line will eventually continue along Wilshire to the Miracle Mile District, Beverly Hills, Century City, and Westwood (UCLA). I'm still waiting . . . 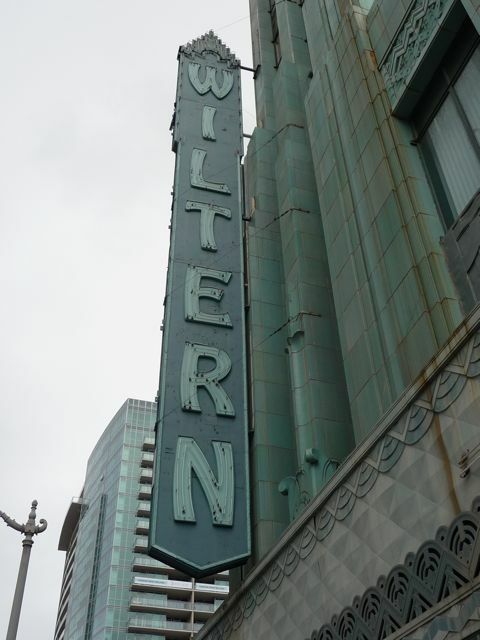 Turning around, another view of the Wiltern Theater. The Pellissier Building is the adjacent office building. Together this is known as the Wiltern Center. 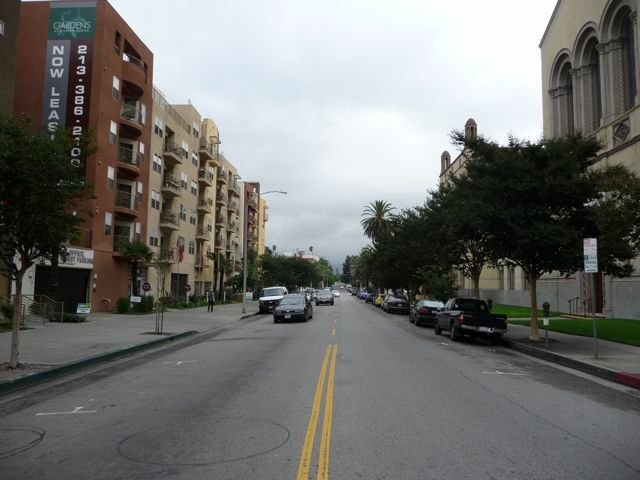 Walking east along Wilshire. Los Angeles is a hard place to get your head around. While doesn't have the density of cities like New York, London or Paris, it is none the less very urban. In addition, this entire section of Wilshire is also technically part of Koreatown, yet lacks the "ethnic" feel found on Western or Vermont Avenues. Crossing Hobart Blvd, looking north. The apartment complex to the left is pretty typical of the feel of this area. Next up, Wilshire Boulevard Temple. 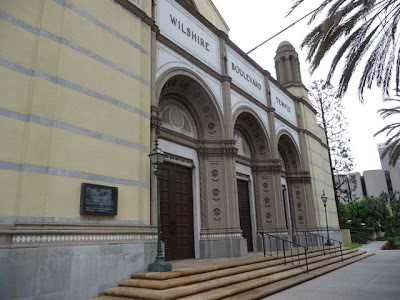 According to our friends at Wikipedia: "Wilshire Boulevard Temple, founded in 1862 as Congregation B'nai B'rith, is the oldest Jewish congregation in Los Angeles. 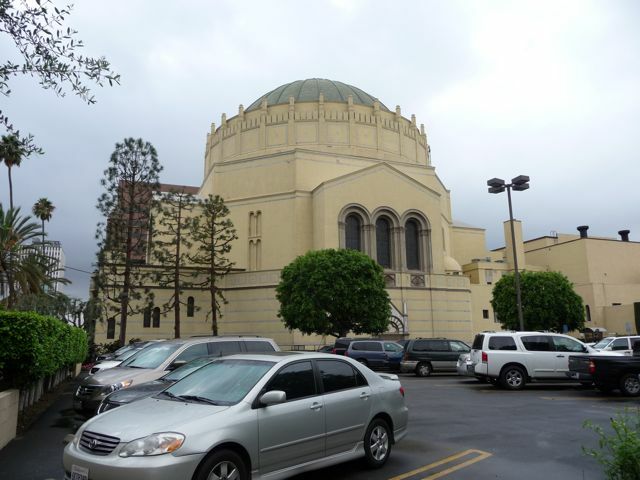 One of the country's most respected Reform congregations, Wilshire Boulevard Temple's magnificent sanctuary, with its iconic dome and Warner Murals, is a City of Los Angeles Historic Cultural Monument and is listed on the National Register of Historic Places." Throughout Los Angeles, there are dozens of kiosks like this with historical information about neighborhoods or specific buildings. This one describes Wilshire Boulevard Temple's connection to Hollywood and the entertainment industry, including Harry, Albert, Sam and Jack Warner (founders of Warner Brothers Studios). 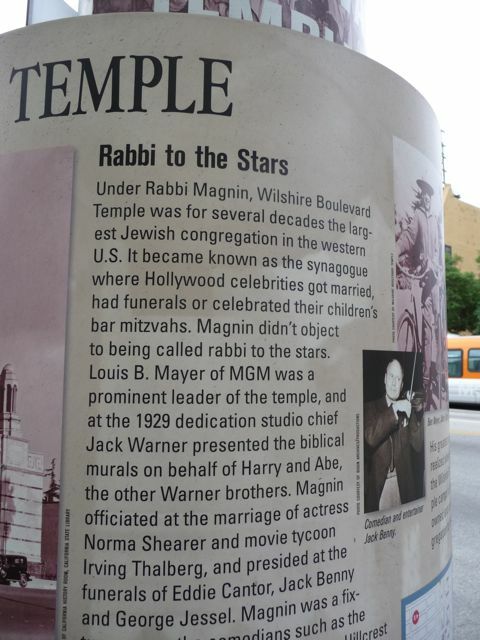 As an aside, I understand that six of the seven major studio heads in Hollywood are Jewish. 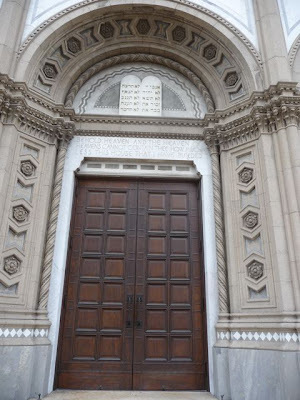 As a Christian, I'm continually impressed by the impact that the Jewish community - comprising less than 2% of the American population - has had, and continues to have, to have on the larger culture. I mean that in a very positve way, and really believe it's something I and other Christians can learn from. Despite the fact that Wilshire Blvd. is the busiest street in city, and Koreatown is one of the most densely populated neighborhoods - this being Los Angeles, the Temple has a parking lot along Wilshire - in many ways a vestige of when this area was much more "suburban." The Wilshire Boulevard Temple is just one of several historic "houses of faith" in Koreatown. More on this - and the impact the Korean-American community has had on several historic churches - in the next post.